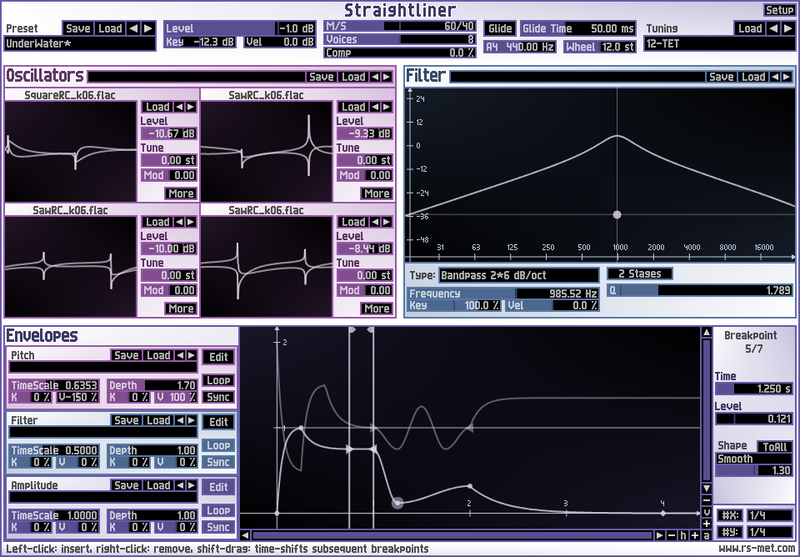 Straightliner is a straight-lined and modern approach to subtractive synthesis. Instead of trying to faithfully emulate old analog synthesizers with all their physically imposed limitations, Straightliner takes full advantage of the extended possibilities that software based synthesis offers: the oscillators support loading of arbitrary (single cycle) audio files. Flexible modulation generators, which allow to define an arbitrary number of breakpoints, are available for pitch, filter-frequency and amplitude. The filter has a lot of different modes, among them the usual suspects like lowpass, highpass, bandpass and a sophisticated Moog-filter model. The whole signal path is laid out in stereo which allows for big and enveloping sounds even without any effects. The user interface of the synth focuses on visual editors instead of the commonly seen hardware oriented interfaces. ...all well and good, but by far the most important aspect of a synthesizer is its sound, of course. I produced some democlips which were created by Straightliner only, playing one patch at a time without any post-processing. You may verify this yourself by reconstructing the demos with the StraightlinerDemoClipReconstructionPack.zip. It comprises the required MIDI files which you may import into you favourite DAW, then route the MIDI-track to Straightliner and load the appropriate patch into the synth. Most patches are factory-presets and in the other cases, the patch-file is also included in the reconstruction pack. To keep the download size of the synth small, the archive above contains only those waveforms that are required to load the presets and a few more. A more comprehensive library of waveforms (several thousands of them) can be downloaded here: CyclePack.zip. These are all single cycle waveforms which were either created by myself or taken from resources that were released under the Creative Commons License. The whole pack is released under this license as well. To use these waveforms, drop the archive into Straightliner's Samples folder (which should sit in the same directory as the .dll) and extract the archive directly there (right-click -> extract here).